Bagan, the home to thousands of temples and ruins does not have ordinary entertaining nightlife such as clubs. 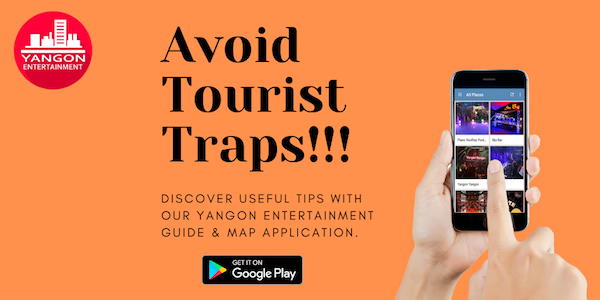 There are bars and restaurants in the new Bagan area. And if you are a massage crazy, there are some good massage in Bagan we can recommend. But please don’t expect other additional services beyond massage. This hotel is located in Nyaung U, quite far from the city area. Unless you are not staying at this hotel, it is quite difficult to reach this place at night time. Location: Nyaung U – Kyaukpadaung Road, near Toll Gate. This hotel is located in old Bagan. So it is said to be at the very good location. But massage price is quite pricey. Thai Traditional Massage price costs 40 USD for one hour and Myanmar Traditional Massage costs 35 USD for one hour. Essential Oil massage is also available at Aye Yar River View Resort and it costs 40 USD for one hour. You can only have Myanmar traditional massage at Thiri Gayhar Hotel. Price for a foreigner is 15,000 MMK and price for local is 10,000 MMK. You can have both oil massage and Thai massage at Sincere Smile Hotel. It has both traditional and oil massage service and oil massage costs for 20,000 MMK for one hour. Tripadvisor recommend massage spa in Bagan is Acacia Day Spa. 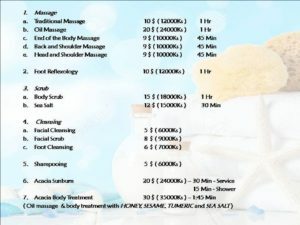 Acacia spa Package price are as follow. Location: Beside of Bibo Restaurant, Near FIT Road, Nyaung Oo. This hotel offers Harbel oil massage, Traditional Thai massage, and foot reflexology. 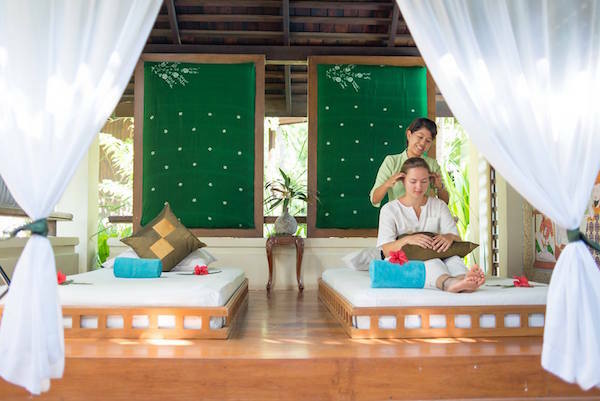 It offers Traditional Thai massage, Head and faces massage and Head and Shoulder massage. Wellness retreat package at Bagan Lodge Hotel is costing around 100 USD per session. But you will get the best wellness service there. There is an additional service in Bagan, too. I didn’t know that I visited Bagan last time. I heard it from a masseuse in Yangon. She worked at a hotel in Bagan about six years. She told me that there are many western customers who want to get an additional service. They are tourists so that they pay much. The reason why she came back to Yangon is that she earned much and she has a family here. Thanks. We also have a list of the massage in Bagan which provide additional service. But we are verifying it’s info. Will create new post about it soon.